Muscles of the shoulder are shown in Figures 7.14 and 7.15. They are also listed in Table 7.4. The muscles of the shoulder attach the scapula to the thorax and move the scapula; they also attach the humerus to the scapula and move the arm. Of the muscles that move the scapula, we have already discussed the trapezius. Serratus anterior is located below the axilla (armpit) on the lateral chest. It runs between the upper ribs and the scapula. It depresses the scapula and pulls it forward, as when we push something. It also helps to elevate the arm above the horizontal level. Deltoid is a large, fleshy, triangular muscle (deltoid in Greek means triangular) that covers the shoulder and causes a bulge in the arm where it meets the shoulder. It runs from both the clavicle and the scapula of the pectoral girdle to the humerus. This muscle abducts the arm to the horizontal position. Pectoralis major (Fig. 7.14) is a large anterior muscle of the upper chest. It originates from a clavicle, but also from the sternum and ribs. It inserts on the humerus. The pectoralis major flexes the arm (raises it anteriorly) and adducts the arm, pulling it toward the chest. Latissimus dorsi (Fig. 7.15) is a large, wide, triangular muscle of the back. This muscle originates from the lower spine and sweeps upward to insert on the humerus. The latissimus dorsi extends and adducts the arm (brings it down from a raised position). This muscle is very important for swimming, rowing, and climbing a rope. Rotator cuff (Fig. 7.15). This group of muscles is so named because their tendons help form a cuff over the proximal humerus. These muscles lie deep to those already mentioned, and they are synergists to them. Figure 7.15 Muscles of the posterior shoulder. The right trapezius is removed to show deep muscles thatmove the scapula and the rotator cuff muscles. The muscles of the arm move the forearm. They are illustrated in Figure 7.16 and listed in Table 7.4. Biceps brachii is a muscle of the proximal anterior arm (Fig. 7.16a) that is familiar because it bulges when the forearm is flexed. It also supinates the hand when a doorknob is turned or the cap of a jar is unscrewed. 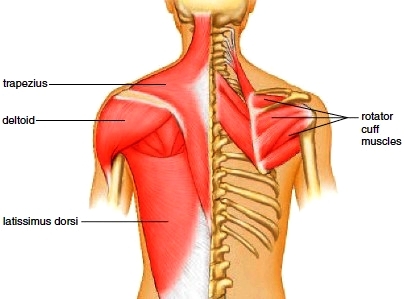 The name of the muscle refers to its two heads that attach to the scapula, where it originates. The biceps brachii inserts on the radius. Brachialis originates on the humerus and inserts on the ulna. It is a muscle of the distal anterior humerus and lies deep to the biceps brachii. It is synergistic to the biceps brachii in flexing the forearm. Triceps brachii is the only muscle of the posterior arm (Fig. 7.16b). It has three heads that attach to the scapula and humerus, and it inserts on the ulna. The triceps extends the forearm. It is sometimes called the “boxer’s muscle” because it extends the elbow when a punch is thrown. The triceps is also used in tennis to do a backhand volley. Figure 7.16 a. Muscles of the anterior arm and shoulder. 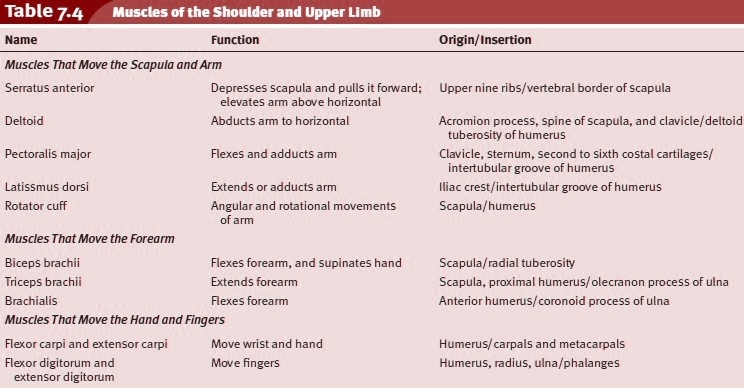 b. Muscles of the posterior arm and shoulder. The muscles of the forearm move the hand and fingers. They are illustrated in Figure 7.16c,d and listed in Table 7.4. Note that extensors of the wrists and fingers are on the lateral forearm and flexors are on the medial forearm. Flexor carpi and extensor carpi muscles originate on the bones of the forearm and insert on the bones of the hand. The flexor carpi flex the wrists and hands, and the extensor carpi extend the wrists and hands. Flexor digitorum and extensor digitorum muscles also originate on the bones of the forearm and insert on the bones of the hand. The flexor digitorum flexes the wrist and fingers, and the extensor digitorum extends the wrist and fingers (i.e., the digits). 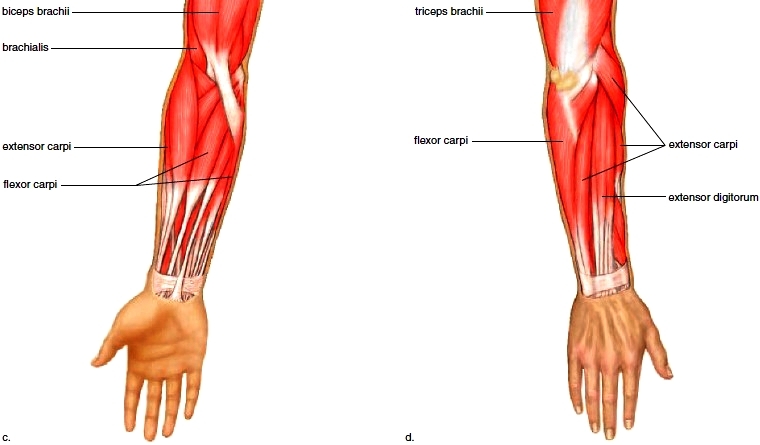 Figure 7.16 c. Muscles of the anterior forearm. d. Muscles of the posterior forearm.